an argument persists all day. i tell him to get out of my apartment. mostly, it all feels terrible, but it is good to have a chance to yell. after we read books, i sing “puff the magic dragon” to my youngest before bed. i sound like my mother. i could sing it a thousand times and never tire. 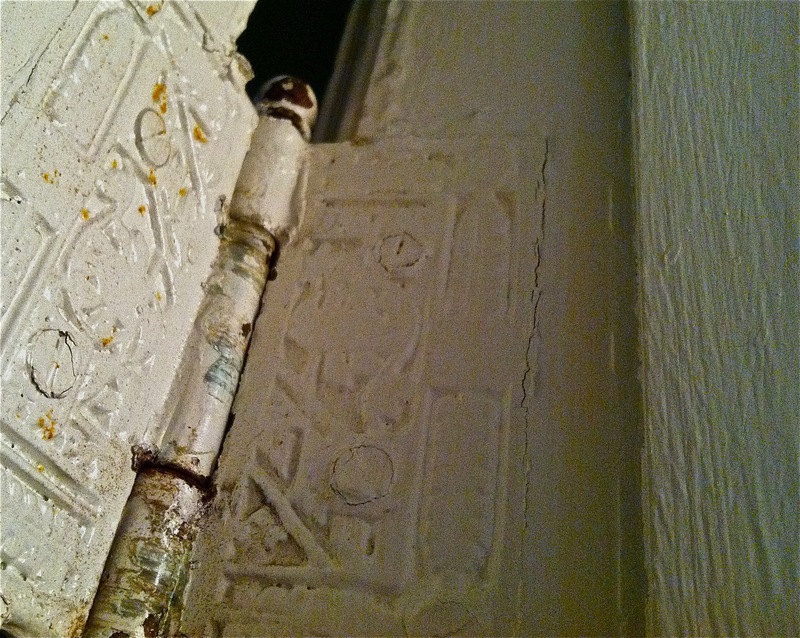 the photo in this blog post is a hinge in my apartment. the doors are solid wood. the building is old, but i am relatively new to it. it’s only beginning to tell me who it is. like these lovely hinges, for example: i’ve been here almost seven months, and i just noticed them a few days ago. i live in a historic district, and the park it borders used to be a cemetery. i think often about the bodies there, moved or not, and promise myself i’ll do some research. but not before letting my mind run with it a bit. the facts of a story aren’t always what matters. it’s how it feels, how you can play with it on your tongue. because it’s somebody else’s turn. because i’ve been standing in the middle of the road alone and no one has come to meet me. because it’s dangerous to stand in the road. because a girl can only take so much. he criticizes me for how i behaved after my mom died. first, it was i didn’t get back into taking care of the house quickly enough. today, it was i didn’t talk to him for two years. trust this: we won’t be having a conversation long enough or involved enough for him to come up with a third example. But it’s good that you’re finding things (hinges; Puff; expressing the negative feelings through verse that rages in its beauty) to keep it all at bay. You can’t build a wall of numbness and expect to survive; the wall has to be full of good things. beautiful strong poem, adore the worm that’s an apron string. I just got gifted a chance to pass on the Versatile Blogger Award……. it’s now yours! And thanks for continuing to share your writing (and non-writing) journey! It’s nice to read some good poetry from a fellow Albany poet. And ‘february, without snow’ is the poem I wish I wrote.